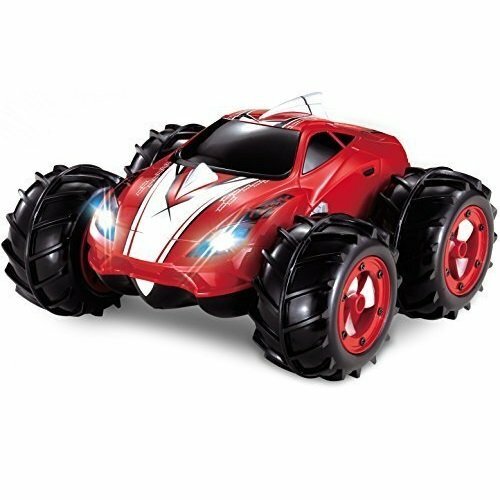 I just got this great little RC amphibious car from Homeco and it is so much fun. I got this for my nephews and they love it. You can drive it on land and water! They had a blast with it at the park, they were able to easily drive it over the different terrains at the park (grass, dirt, rocks) no problems at all. They also played with it in the water for awhile and had a blast with that, I think that was their favorite part. The range on the remote is pretty good, the boys were able to be pretty far away from it and still control it. They stayed pretty close but I did notice that there were times when they had a good distance maybe 100 feet and it was still working great. The car was very responsive to the remote when they were playing with it. It did everything they instructed it to do. It was very durable. They played with it for a couple of hours and were pretty rough with it and it’s still in one piece with no damage. Very easy to set up and use. The remote takes a 9 volt battery (included) and the car runs on a rechargeable battery which is great. As a mom I am always looking for way to save on those expensive batteries so I was happy to see the rechargeable battery and charging cable in the box. And the battery stayed charged just fine the entire time they played with it so it has a good life on it. Very nice gift idea and lots of fun!